Harry Lloyd talks with TV Time Machine host Jim Benson about starring in his new spy/paranormal TV series Counterpart, which airs Sundays at 8 PM only on Starz. 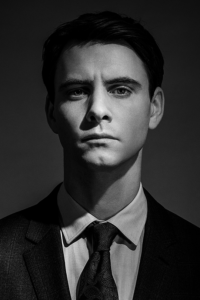 In this audio edition of the TV Time Machine, we welcome Harry Lloyd of Counterpart. Mr. Lloyd is an accomplished actor, having appeared in such films as The Theory of Everything and The Iron Lady, and is probably best known for his role in the Emmy Award Winning TV series, Game of Thrones. Over the next audio segment, Harry Lloyd talks about his new series about a secret parallel world in Counterpart, which airs Sundays at 8 PM only on Starz. Again, for those of you intrepid enough to experience some double trouble, feel free to meet you, yourself, and I, as we leave our individuality in the past, in order to meet our doppelganger face to face, in the present!